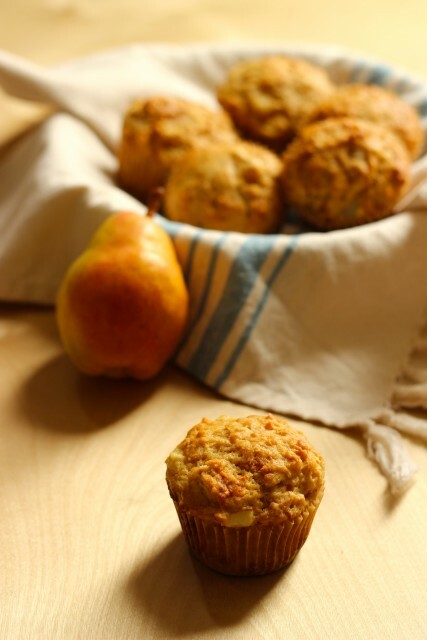 Bake up delicious pear muffins with little work, thanks to a homemade baking mix. My big box of muffin papers came. FishBoy12 thinks his grandkids won’t need to buy muffin papers. I beg to differ. These papers coupled with the best muffin pan in the world make muffin making super fun. Nothing sticks or burns and clean up is a breeze. Truth to saving money: if things are easy to do, you’ll do them more often. So make eating at home on a budget easier on yourself. So, as part of my freezer cooking for the month, I prepped a bunch of muffin mixes. Preparing homemade baking mixes makes baking so much easier. These muffins came together in a flash. I just chopped a pear, mixed up the wet ingredients, dumped in the dry, and folded it all together. Thirty minutes later we had delicious, piping hot muffins to eat with breakfast. Since our sugar fast, some of my standby recipes taste a little too sweet to me, particularly those that call for white sugar, which seems to be all sweet. So, for this rendition, I reduced the sugar to 2/3 cup and used brown sugar which adds a little more depth of flavor. The result was a sweet breakfast bread, not dessert for breakfast. We really enjoy this flavor combination. Remember, with my Mix and Match Muffin recipe, you can experiment with all kinds of mix-ins. These would be really nice with a handful of dark chocolate chips thrown in. Or you could use chopped nuts or a different fruit or a different extract or …. You get my drift. Muffin making can be easy. 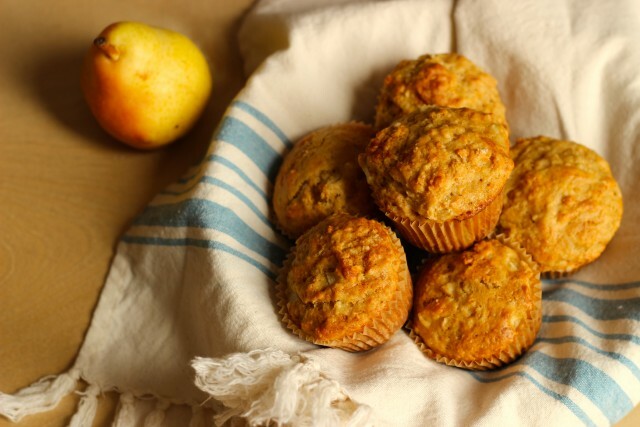 Just tool up and make homebaked muffins and easy and tasty part of your week. Preheat the oven to 350°. Line two 12-cup muffin tins with 18 paper liners or spray with nonstick cooking spray. In another large bowl, whisk together the flour, sugar, baking powder, and salt. (Or use this homemade muffin mix!) Fold the dry ingredients into the wet. Add the pear and gently fold. Divide the batter into the 18 prepared cups. You can do more or less, just adjust the baking time. Bake until golden brown and a tester inserted comes out with a few crumbs attached, about 25 minutes. Cool on a rack. Prepped muffin mixes saved my mornings countless of times. Thanks for this awesome muffin recipe. Thank you so much for posting this recipe! I just bought some apple-pears from Costco. They were a good price and I thought they would be something different and fun, but none of us cared for them. They have been sitting in my fridge until I could find something to do with them. I just found my answer! I, too, find that most recipes have too much sugar. I am in the habit of cutting the sugar and using brown the majority of the time. Thanks, again, for the recipe. Pinning! I plan on making these. If I don’t venture out for sunflower oil, what do you recommend? What about coconut? (mine has no coconut scent).